We’re gearing up for a very special weekend full of cassoulet delights! For those who don’t know, cassoulet is a traditional French dish that is made in the winter months from beans and various meats (or veggies, in the case of vegetarian cassoulet). Of course, if you’ve spent any time around Jimmy’s No. 43 in January, then you know… it’s all about the cassoulet! From Saturday, January 12, through Monday, January 14th, we will be celebrating one of our favorite winter dishes with three amazing (and amazingly different) tasting events. Centering these events will be The Fifth Annual Cassoulet Cookoff. 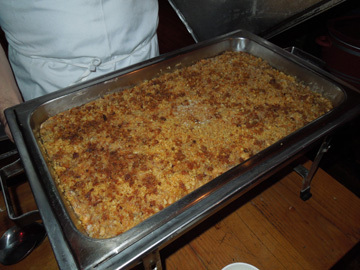 This year the format is a little bit different: $30 (cash only) at the door gets you one drink (beer, wine, hard cider or soda) and two hours of unlimited cassoulet samples by professional and amateur chefs (there’s still time to join in the cookoff; chefs e-mail for specifics). The cookoff takes place from 1-3 p.m. on Sunday (1/13 – tickets will go on sale at noon), with proceeds to benefit the NYC Greenmarket programs. If you’re looking for something a little more lowkey (yes, our cassoulet cookoff packs them in! ), you might be interested in trying our Beer & Beans from noon-3 p.m. on Saturday (1/12). We’ll be pairing some of our favorite beers (tickets/beer list here) with three different styles of cassoulet (bean/meat) made by guest chefs including Josh Stokes (f/o Gramercy Tavern), Patti Jackson (f/o I trulli), and Jimmy’s No 43. What pairs best? An American Ale with duck cassoulet? A Stout with pork? A fine pour from Belgium with vegetarian? You get to be the judge! And if wine is your preferred drink, we have the perfect match up (mash up?) when Neal Rosenthal Imports pairs French wine with a five-course prix fixe dinner (tickets here – we are almost sold out, so don’t wait to buy yours!). Wines will be selected from the Rhone Valley and Languedoc region by Blake Johnson our longtime wine expert at Rosenthal. Tags: Jimmy's No. 43, postaday. Bookmark the permalink.